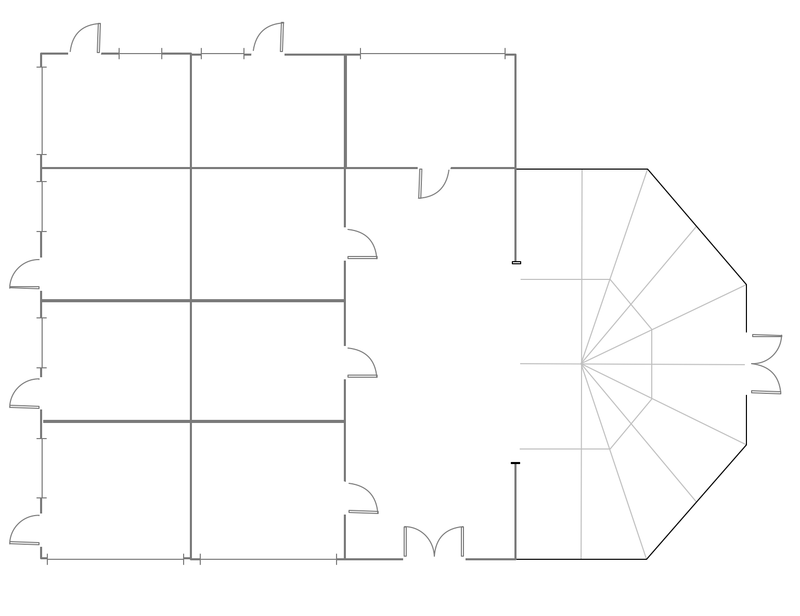 The Floor Plans solution from the Building Plans area of ConceptDraw Solution Park includes the 15 vector stencils libraries with 666 symbols of interior design elements, furniture and equipment for drawing economy and limited service hotels and bed and breakfast floor plans and space layouts using the ConceptDraw DIAGRAM diagramming and vector drawing software. An establishment, which provides lodging on a short-term basis can be called a “hotel”. The owners of such establishment usually charge people for living there on a short basis, as well as for a long period of time. It was popular long time ago to live in the hotels instead of buying or renting apartment as you do not have to clean as much in the room, in which you live in this hotel, but having your own apartment you have to hire someone to help you out, to clean instead of you for money, or you have to take care of it yourself. The facilities, which can be provided to all those who live in such accommodation may vary from a good quality mattress in not a large room at all to the large suites where big good quality beds can be found as well as another luxury and good looking furniture is, such as a dresser, your own kitchen with a fridge and other kitchen facilities, many chairs and even a few tables, a television with a big screen as well as great bathroom. There are many different hotels all over the world, especially in the big cities. There are both small hotels which can be rented for a low price and which may offer only basic guest facilities, and there are large hotels with bigger rooms and, of course, more expensive ones. These large expensive hotels may provide lots of different facilities and their owners usually offer the hotel guests to use swimming pool, business centre, childcare zone with nannies, conference facilities, sport courts, such as tennis and basketball, gym, at least one or even a couple of different restaurants with different cuisine, spa and other services. All of the rooms in the hotel usually have their numbers mentioned on the rooms’ doors. These numbers, which can be found on the doors can help the hotel guests to find their room quicker and so to use it sooner. Especially it is important to provide a place for staying overnight for those, who travel and who is tired and so they need to have some rest the sooner the better. Some so-called “boutique hotels” have decorated rooms especially for their customers who like something special and extraordinary. Some of the hotels offer food for free as it is all included in the price of renting the rood, some – only breakfast and a few hotels do not provide any food at all, but drinks. It is interesting to notice, that in the United Kingdom each hotel is required to serve both food and drinks to all of their hotel guests, but usually within only some particular hours. There are very interesting so-called “capsule hotels”, which can be found in Japan and which are quite popular both for local people and for the foreigners: for tourists who come to see Japan. These capsule hotels provide only a very small room, which includes one bed, so this room can be used only for sleeping overnight and that is it. The very first precursor to the nowadays modern hotel was the one in the medieval Europe called “inn”. This “hotel” was popular for about 200 years, starting from the middle of the 17th century, proving people with a bed for only a night or two. Inns transformed into the proper hotels a century later in the middle of the 18th one. One of the first hotels, known as those which are popular now, was opened in 1768. These first hotels increased their popularity in Western Europe as well as in the North America in the early 19th century. The luxury hotels began to be popular later, in the 19th century. There is a huge choice of so many different hotels nowadays: they all have different sizes, have their functions and they cost also very differently. Most of the hotels as well as other similar structures (like hostels, etc.) are all similar to the classical hotel type. That type of the hotels providing so-called “all-inclusive” service usually includes the amenities, accommodations, restaurants or cafes which can be used within the borders of the hotel territory as well as a good service, such as laundry, etc. The “boutique hotels”, which were mentioned above, are usually smaller, but they have a nice choice of the rooms as each of the rooms can be in a different style and with its unique interior. The sizes of the hotels vary from small to medium and up to the large ones, but usually the larger territory of the accommodation they provide, the more expensive it can cost, although it also depends on the other circumstances, such as the place where the hotel is and if it provides other facilities and services, than just a room, nevertheless it is a large room. Economy hotels, which are popular for students or for people who do not have as much money or they want to save money being quite happy with a bed to stay a night in, usually have small to medium-sized establishments and their owners usually offer only basic accommodations. There is another popular place for people to stay in which is called a “motel”. A motel is a lodging, which is usually small-sized with direct access to the individual rooms from outside, for example from the car park. The word “hotel” itself comes from the French word referring to a French version of a building, which can be often seen by many different visitors and which can provide more care, than just accommodation. Most of the hotels have their widely accepted standards for classifying these types of the hotels. The most popular categories include the terms, such as “luxury”, “boutique” or “lifestyle” hotels, “full-service” ones, “focused service”, “economy” with limited service, “extended stay”, “destination clubs” or either “timeshare clubs”, “motels”, “bunker” hotels , which can be found in Switzerland or Albania, “cave” hotels, “cliff” hotels, “capsule hotels”, described above, “one-day room” hotels and other. But it never matters which hotel plan you want to illustrate in a way of a floor plan, you can always do it with ConceptDraw DIAGRAM especially it can be simple to do having the “Floor Plans” solution, which can be downloaded from the Building Plans area of ConceptDraw Solution Park on this site. Solution Floor Plans from ConceptDraw Solution Park provides vector stencils libraries with design elements for drawing mini hotel plans. Simply add walls, windows, doors, and fixtures. Use ConceptDraw DIAGRAM diagramming and vector drawing software enhanced with Floor Plans solution to draw your own site and floor plans, design and layouts. Still doubting about the number of tables in your cafe? You should create a cafe floor plan that will answer all your questions and reflect all the details of your cafe interior. Get started in several minutes and unlock your creativity with dozens of ConceptDraw DIAGRAM v12 templates and examples! Dealing with interiors plans for HoReCa business, for example, developing a plan for cafe you will meet with both creative and architectural challenges. First of all , the layout of cafe should be beautiful and convenient for visitors. Being developed sagely a plan of your cafe leads to successful sales and good benefits. Designing a cafe floor plan includes various elements that can be picked out using ConceptDraw Cafe and Restaurant Floor Plan solution. The vector objects library supplied with Cafe and Restaurant solution provides a number of graphic objects for displaying different layouts and styles of catering establishments. Electrical plan is a document that is developed during the first stage of the building design. This scheme is composed of conventional images or symbols of components that operate by means of electric energy. To simplify the creation of these schemes you can use house electrical plan software, which will not require a long additional training to understand how to use it. You only need to install the necessary software ant it’s libraries and you’ll have one less problem during the building projection. Any building contains a number of electrical systems, including switches, fixtures, outlets and other lightening equipment . All these should be depicted in a building electrical plans and included to general building documentation. This home electrical plan displays electrical and telecommunication devices placed to a home floor plan. On the plan, each electrical device is referenced with the proper symbol. Electrical symbols are used for universal recognition of the building plan by different persons who will be working on the construction. Not all possible electric symbols used on a certain plan, so the symbols used in the current home plan are included to a legend. The electrical home plan may be added as a separate document to a complete set of building plans. It’s a challenge for any administer to set a brand new corporate network. Talking about network parameters, we should mention that network layout is important for network efficiency and reliability. After the budget is accepted, you need to make a network topology draft. The diagram of computer network layout is a tool of IT specialists and corresponding departments of diversified organizations. Also the responsibilities of any network or system administrator include making network layout diagrams, since they are important piece of any network documentation package. ConceptDraw solution for networking and diagramming offers more than 1000 vector object, composed into the 40 libraries that are designed to to getting started with making professional network layout diagrams. As restaurant industry is growing rapidly nowadays, researches show that almost half of the adults have worked in a restaurant or a cafe. Moreover, many of them dream to start their own someday. Unfortunately, it takes a lot of time to write a business plan and to find a great location, although some know how to create a restaurant floor plan in minutes or how to plan budget effortlessly. Hiring employees can also cause a lot of headache, but this is crucial for further success, because every guest comes to restaurant for a good service and delicious food. It is also worth noting that restaurant concept is also important, because it defines target audience and influences the menu. This diagram represents the floor plan of an ongoing sports-theme establishment - restaurant, cafe, or other food service. A number of widescreen monitors installed along the perimeter provide visitors the opportunity to follow the course of a match from anywhere in the dining room of restaurant or cafe. The most of sports fans believe that food and alcohol is a big part of any sports show. That is why the dining room takes the most space - almost 60% of the total establishment space. Nearly all sports fans consume beverages while watching sports - beer, soda or water at least. Thus, the restaurant floor plan designers added a large lavatory there. Moreover, project developers considered unnecessary the gender division of such delicate place - perhaps they guess that only men are watching football, or believe that alcohol will eliminate the most of gender differences. Solution Building Plans from ConceptDraw Solution Park provides vector stencils libraries with design elements of interior, furniture and equipment for drawing hotel plans and space layouts. Use ConceptDraw DIAGRAM v12 diagramming and vector drawing software enhanced with Building Plans solution to draw your own site and floor plans, design and layouts. ConceptDraw will help you to create the room planning of any configuration quickly and skillfully. 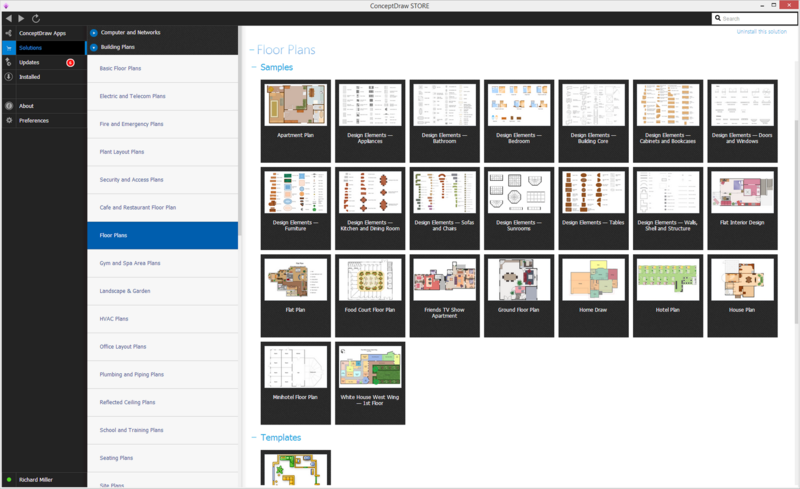 ConceptDraw contains a number of ready templates for creation of premises plans, and due to libraries with interior objects existing in the program you will be able to place furniture, denote the location of doors and windows and indicate dimensions. ConceptDraw Network Diagram Software is ideal for network engineers and network designers who need to draw Physical Network Diagrams. Architectural drawing allows to show the location of a building or ensemble of buildings on the ground, indicating the cardinal points. For centuries, people had been studying architecture in universities to learn how to draw building plans and now everyone can do it easily just using appropriate software. While developing the building plan, its graphic part, you can display the part of the floor or the entire floor of a building with an indication of the exact location of the drawn premise. Small-sized apartments does not restrict the advanced interior design opportunities. Here is a detailed and precise floor plan of a pretty small apartment. A furniture objects are added to show possible interior of this home. This plan can be used to help somebody with a floor layout and furniture arrangement. Having this floor plan in a pocket while shopping would be useful to check if there is enough rooms for a new furniture. If it is necessary for you to create the building plan you can draw it manually on the sheet of paper, but also you can use special software. With the help of ConceptDraw you can create the building plan of any difficulty. Thanks to special templates and objects libraries this won't take you much time and won't demand special skills. Architect Software — Create electrical diagrams, architectural designs using ConceptDraw.